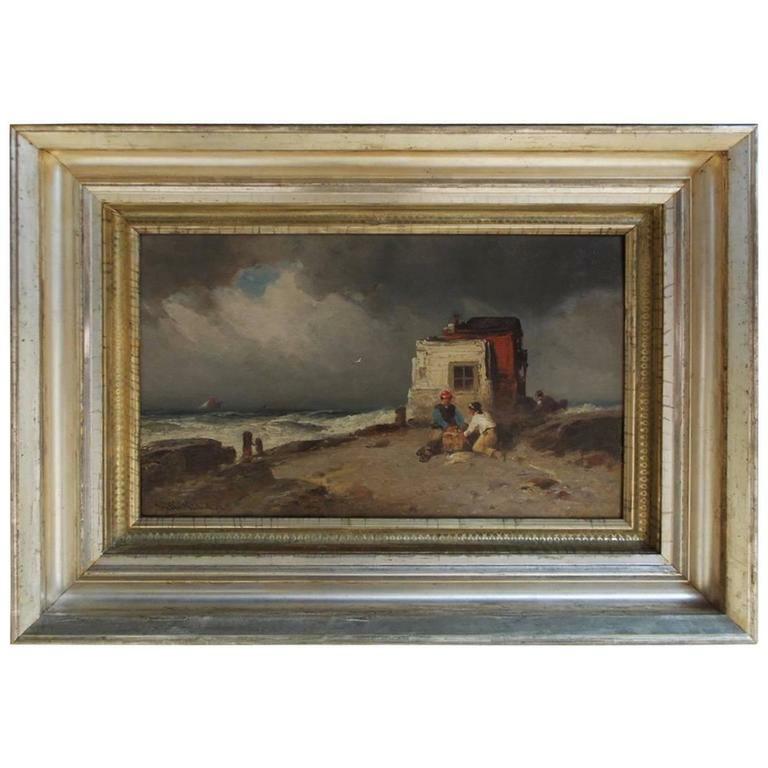 American oil on canvas figural landscape scene painted on the coast of England, G.W. Nicholson. Circa 1870 G.W. Nicholson began painting in the 1850s in New Jersey. Nicholson moved to Philadelphia sometime before 1861where he married a young woman named Jane Elizabeth Bray, by the early 1860s he was teaching art in Philadelphia, most likely in the form of private lessons. At least one younger painter, James Brade Sword, is believed to have studied with him between 1861 and 1863, Nicholson may have studied informally at the Pennsylvania Academy of the Fine Arts in Philadelphia, where he was elected an Associate Artist on April 3, 1865. Like many American artists of the day, he went abroad for additional training, visiting England and France in 1866. Further travels included landscapes and a variety of foreign sites including Holland, Germany, Italy, and Egypt. In 1895 he moved back into Philadelphia and in 1902 he received a gold medal at the American Art Society for a painting titled Harvest Field in Berks County. Seventy years old at the time, he received the award in recognition of his long career as a Philadelphia painter. Around 1902 Nicholson retired to Hammonton, New Jersey, where his son had settled some fifteen years earlier. He lived in Hammonton until his death in 1912 at the age of 80.